I offer interactive workshops and seminars to workplaces, gyms, schools, sporting clubs, and any other settings you can think of. Each and every presentation is interactive, informative and engaging. Workshops are specifically tailored to suit the topic, setting and audience. Healthy eating and food is my absolute passion, and I love talking about it to anyone who is eager to learn more. 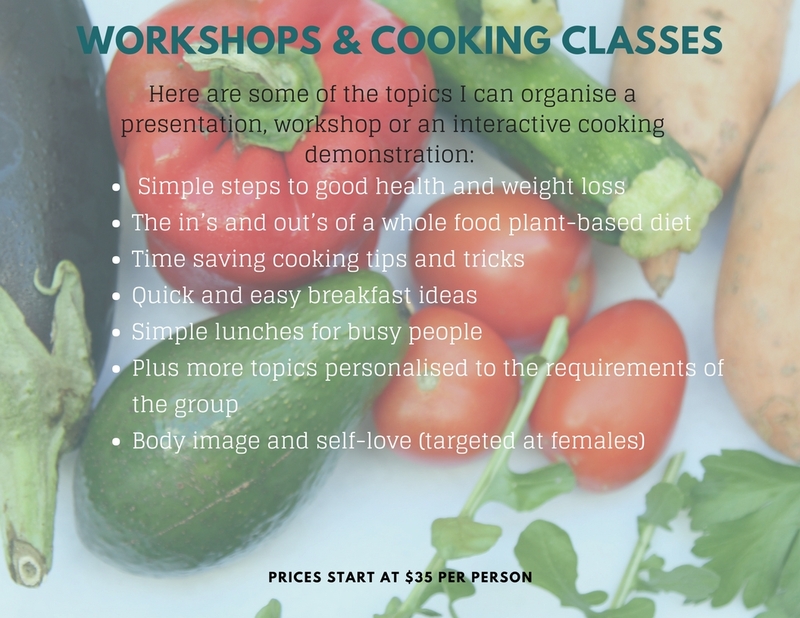 My workshops and cooking classes include: skill sharing, learning about the scientific evidence that supports this way of eating, health properties as well as practical information that the audience can use to improve overall well-being. Attendees will be guided through an interactive cooking class which will include taste testing and question time. The content is delivered in engaging and easy to understand terms. Don’t worry I won’t let attendees go without enjoying the fruits of our labour as well as receive a copy of the recipes to take home and try out themselves! All recipes are simple to make and are based on whole foods. Interested in holding a workshop? Send me a message here letting me know exactly what you are after, and I will be delighted to prepare something especially for you!